There's a huge difference between laying down and area rug and installing wall-to-wall carpeting. For one thing, the latter involves cutting the floor covering so that it fits the room precisely. These tips can help you handle that portion of the job with relative ease. Installing wall-to-wall carpeting? It can be tricky to cut the floor covering so that it accurately fits the room. 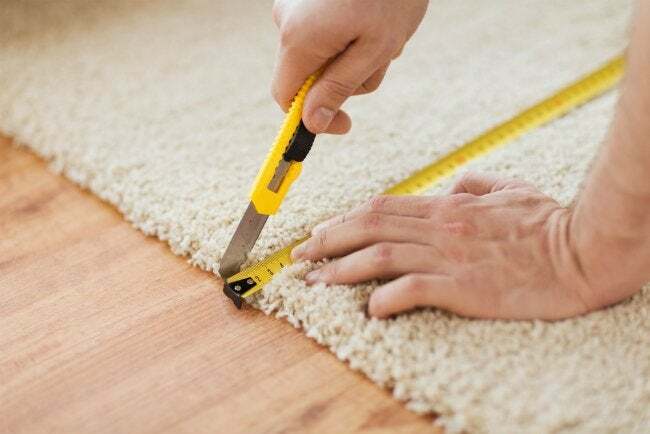 To speed the process and minimize hassle, remember these tips on cutting carpet. First things first, know that a utility knife—a sharp utility knife—is the best friend you can have for a job like this. If you’re cutting carpet for a big room, it may be necessary to change out the blade several times before you get finished, but those little interruptions will pay big dividends. Whenever possible, work on the back side of the carpet. The backing is flat, with no thick pile to get in your way. Outline your cuts with a marker before making them with the knife. And for the sake of accuracy, consider using a straight edge to guide your marker. For trimming in around intricate shapes, use short, incremental cuts. Creating a cardboard template of the shape you’re aiming for can also be a big help. Since walls aren’t always built perfectly on the square, especially in older homes, it’s best to measure both the width and the length of the room from a couple of different spots. Much better to be surprised before your cuts, not after!